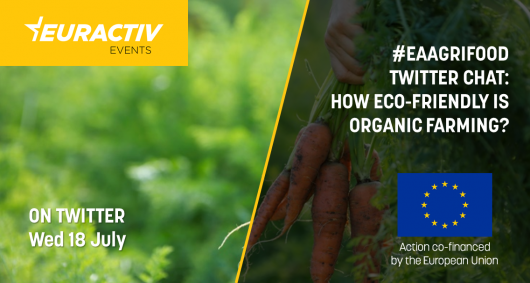 #EAAgriFood Twitter Chat: How eco-friendly is organic farming? The Twitter chat is taking place on Wednesday 18 July from 12.30 to 13.30. Please add #eaAgriFood to all your tweets. Considerable efforts have been made to boost organic farming in the EU through the Common Agricultural Policy’s (CAP) rural development pillar. But while production has significantly increased, the demand is growing disproportionately. According to official data, the total organic farmland area in the EU increased by 18.7% between 2012 and 2016. Analysts estimate that Spain, Italy, France and Germany represent more than a half of the EU’s total organic farmland (54.4%). The quality of organic food is particularly appealing to the rising middle-class in Asia and in other parts of the world and EU organic farmers are making efforts to catch up. “The market is growing faster than production. Consumers and industries are increasingly demanding organic products that the internal production cannot provide,” an EU official recently told EURACTIV. When it comes to trade deals with third countries, several MEPs in the past noted that organic products are supposed to limit the carbon footprint and be sustainable from the point of view of resources. However, there are no requirements regarding the carbon footprint of organic products in the EU organic legislation. Q1. What is the future of the EU organic farming post-2020? Q2. Is organic farming green enough? Should the transport carbon footprint also be taken into account? Q3. Is organic food enough to feed the rising population? Q4. Is organic production only meant for local consumption? Q5. How can we make organic food more affordable for regular consumers? What is a Twitter chat and how to join it? A Twitter Chat is a discussion between Twitter users that get online at a pre-arranged date and time to discuss a specific topic that uses a designated #hashtag (for this chat it’s #eaAgriFood). The host of the Twitter Chat posts questions that are usually identified as Q1, Q2 and so on, to prompt answers, which are usually identified as A1, A2 and so on, from the participants. The host of this edition will be @eaAgriFood, so make sure to follow the account. Twitter Chats usually last about an hour. The hashtag links the questions and answers in a virtual conversation. The best way to see the entire conversation is to search for the hashtag #eaAgriFood on twitter and switch to the "latest tweets" tab. Please let us know that you intend to join this online Twitter discussion by tweeting at @eaAgriFood and mentioning “#eaAgriFood chat” or sending us a message @eaAgriFood.